Run a Speed Test to determine if you meet the recommended minimum requirements, 20/5 Mbps are highly recommended. At Hortonworks University, the mission of our certification program is to create meaningful certifications that are recognized in the industry as a confident measure of qualified, capable big data experts. How do we accomplish that mission? Our certifications are exclusively hands-on, performance-based exams that require you to complete a set of tasks. By performing tasks on an actual Hadoop cluster instead of just guessing at multiple-choice questions, an HDP Certified Developer has proven competency and big data expertise. 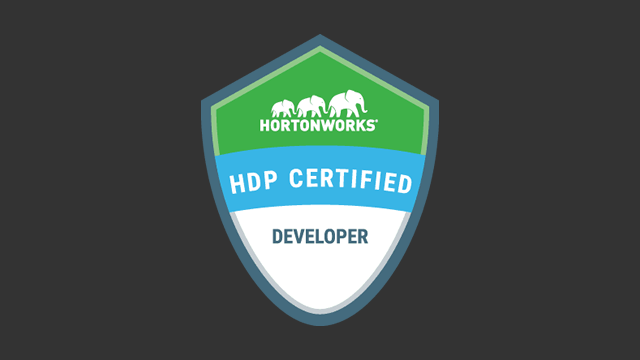 The HDP Certified Developer (HDPCD2019) exam is for Hadoop developers working with frameworks like Pig, Hive, and Sqoop. The cost of the exam is $250 USD per attempt. The purpose of this exam is to provide organizations that use Hadoop with a means of identifying suitably qualified staff to develop Hadoop applications for storing, processing, and analyzing data stored in Hadoop using the open-source tools of the Hortonworks Data Platform (HDP), including Pig, Hive, and Sqoop. The exam is based on the Hortonworks Data Platform 3.1 installed and managed with Ambari 2.7, which includes Pig, Hive, and Sqoop. Each candidate will be given access to an HDP 3.1 cluster along with a list of tasks to be performed on that cluster. The exam is delivered in English. The Hortonworks Certified Developer exam is approximately 2 hours. The Minimally Qualified Candidate (MQC) for this certification can develop Hadoop applications for ingesting, transforming, and analyzing data stored in Hadoop using the open-source tools of the Hortonworks Data Platform, including Pig, Hive, and Sqoop. Those certified are recognized as having high level of skill in Hadoop application development and have demonstrated that knowledge by performing the objectives of the HDPCD exam on a live HDP cluster.